If you own your own business, it is always awesome to see your company getting recognized. Avalaunch Media was featured in Utah Business Quarterly (page 54 if you wanna check it out) My two partners (and co-founders of Avalaunch Media) David Mink and Andrew Melchior were pictured (below) I love how the spread turned out. I am glad to see this company I started originally under my own name (with no real direction other than just “getting people ranked”) take off and explode like it has. The future is bright and I am proud to be a part of this industry with so many other awesome folks. 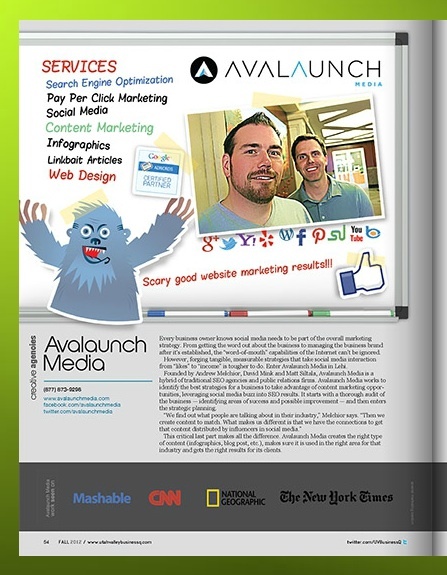 Avalaunch Media in a print magazine!